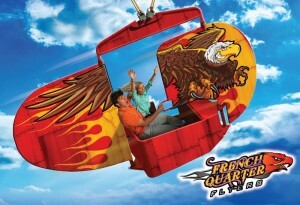 The young and fun at heart will love French Quarter Flyers, a family ride that will delight both kids and adults. This new attraction features eight individual flying cars. Each vehicle has a stationary rear wing and a moveable front wing and can travel at speeds up to 40 miles-per-hour. Guests will be the pilots and control their own riding destiny as they pump up the thrill for a more intense wild flight or simply sit back, take it easy and enjoy the ride. 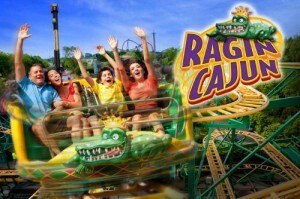 Ragin’ Cajun and French Quarter Flyers are the first of their kind at Six Flags America, adding diverse new thrills found nowhere else in the region. In addition to the new rides and improvements, Six Flags America is preparing to launch the park’s biggest and scariest Fright Fest ever featuring “Thrills by Day” and “Fright by Night”. The daylight hours will be filled with thrilling rides and fun-filled shows, but as the sun sets the park quickly turns to the dark side. With five new, ultra-scary haunted attractions, Fright Fest is the ultimate terrifying experience. Fright Fest begins Saturday, September 28, 2013 and operates every weekend until October 27, 2013. Six Flags America also announced today that 2014 Season Passes are now on sale at the lowest price of the year providing unlimited visits for the rest of the 2013 season (including Fright Fest) and all of the 2014 season. For a limited time, with the purchase of four or more season passes, guests will receive a free upgrade to a Gold Season Pass that includes free admission and free season parking at any Six Flags Theme Park. Annual Memberships, which include all of the great benefits of a Season Pass, are also available online at an affordable monthly price. Offer expires October 27, 2013.